Call it a case of trickle-down resistance. Mar. 02, 2017, 10:00 a.m.
Republican Sen. Pat Toomey held a round of town hall meetings with constituents in August 2013, and the first of those was at The Pine Barn Inn in Montour County. About 50 people showed up, and the most contentious moment was when a 60-year-old man wearing a “Don’t Tread On Me” shirt told Toomey he was “naive” for working with Democrats on gun control. Toomey’s only held a few town halls since — none since August 2015 — and he’s never held one in the city of Philadelphia. His refusal to do so has become a major sticking point. On Tuesday, 11 people begging his staff to put a town hall on the schedule were arrested for staging a sit-in at his Philly office. Hundreds more were protesting outside. It was the latest in the coordinated campaign against Toomey that’s been raging since November, when he won his second term in the Senate after defeating Katie McGinty by 100,000 votes, or about 2 percent. When the Senate was in the process of confirming controversial Secretary of Education Betsy DeVos, Toomey drew several thousand more faxes than any of his counterparts — because his phone lines, specially designed to handle volume, flooded till they burst. There’s Tuesdays With Toomey, a large group of mostly left-of-center protesters who have staged highly coordinated weekly protests at his offices across the state. And there are other demonstrations, like one that took place yesterday. Toomey’s staff moved offices this week from Center City to a federal building at Second and Chestnut (you know, the historic location across the street from Rotten Ralph’s and around the corner from Plough and the Stars). Greeting his staff there were about 75 people staging a welcoming party. This notoriety is new and unusual for Toomey — or any other member of the Senate. He was far from a wanted man during his first term, despite being one of the Senate’s more conservative members. In October 2015, a Quinnipiac poll found 51 percent of Pennsylvanians approved of his job and 27 percent disapproved, better than Democratic Senator Bob Casey. And Toomey’s policy stances haven’t significantly changed in years. The difference is obvious: Donald Trump. Some protesters say that while they didn’t agree with Toomey’s stances before November, they wouldn’t have felt compelled to protest against him now, had their Democratic choice for president won. Now they want Toomey to listen — and to be independent. 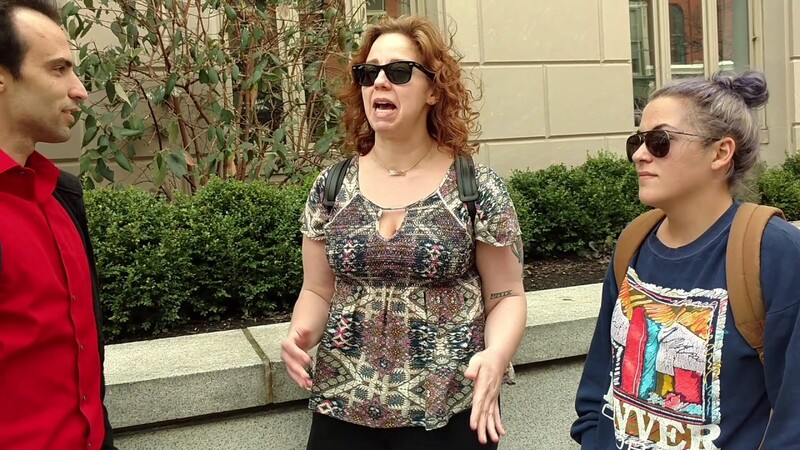 Paige Wolf, a Philly organizer with Tuesdays With Toomey, said that if Trump weren’t elected, the demonstrations against Toomey probably wouldn’t be happening. To her, Toomey was the most powerful local politician. Through him, she and others could create a dialogue affecting policies under Trump and a Republican majority Congress. York Crane didn’t vote for Toomey in November and disagreed with his first-term stances on Planned Parenthood, health care and women’s health issues. But she wasn’t particularly displeased with him either. And it’s trickling out to local politicians who traditionally stayed out of the spotlight. E.R. Anderson, a spokeswoman from Toomey’s office, said the senator is far from a “rubber stamp” for Trump. She pointed out that while he supported Trump’s cabinet nominees, he also voted in favor of most of former President Obama’s nominees. The current legislative agenda — which is focused on Obamacare repeal and regulatory rollback — is based on issues Toomey has championed for years. “Since the election, Senator Toomey has criticized President Trump on the rollout of the immigration halt, the potential for an excise tax in order to pay for a wall along the southern border, and supports the bipartisan Senate Intelligence Committee’s efforts to look in to all things Russia,” she said. The connection to Trump comes despite Toomey attracting a slightly different base than the president. Trump turned Pennsylvania red by winning in previously blue strongholds like in Northeast and Southwest Pennsylvania. He lost traditional Republican voters in Philly and the surrounding suburbs. Toomey did much better here, in the areas Republicans are traditionally supposed to succeed if they expect to win an election. For instance, he won Chester County and Bucks County — counties Trump lost — and performed several points better than Trump in Delaware and Montgomery counties. Toomey, of course, has strengthened his ties to Trump since election night. That’s when he waited until just before the polls closed to announce he voted for Trump. And after saying he would “not be a rubber stamp” for the president in November, he has mostly supported the Trump’s decisions that have angered moderates and Democrats, including the confirmation of DeVos as education secretary. After Trump initiated a travel ban on refugees and immigrants from seven Muslim-majority countries, Toomey said he supported increased vetting and temporary travel suspensions, but did call the executive order too broad and unclear. Republicans who have acted like Toomey have not received the same blowback, not even Republicans in similarly purple states who decline to hold town halls. In Ohio, GOP Sen. Rob Portman has found protesters at events where he speaks or is scheduled to speak. His staffers have not encountered weekly feedback from groups as large or as organized as Tuesdays With Toomey. “If you believe — as I do — in sitting down with those on the other side of the aisle and listening to their concerns,” she said, “and trying to cobble together a compromise you are criticized and in some cases despised by both sides. And that did not used to be the case. The only senator experiencing the closest to what Toomey is would be Marco Rubio. One group has been coming to Rubio’s Orlando office weekly asking for him to hold a town hall (The protests led building management to announce they would not renew Rubio’s lease). Like Toomey, Rubio has declined. He said he thought “liberal activists” would pack a town hall. But unlike Toomey, Rubio came into 2017 with loads more notoriety. He was a presidential candidate many pundits thought would win the Republican nomination and for years had been a rising star in the GOP. Before these last several weeks, Toomey was best known for riding the Tea Party wave to election in 2010 and the gun control legislation he co-sponsored that ended up failing. As the target of so much protest, he has become far more of a celebrity senator than in the past. Terry Madonna, a pollster at Franklin and Marshall college and an expert in Pennsylvania politics, said increasing protests against Toomey are a result of how “deeply polarized” we are as a nation. Madonna said he was stunned when he saw in his most recent F&M poll that 96 percent of self-identifying liberals had a negative view of Trump. Those numbers just haven’t existed before today. But much of Toomey’s new-found status can be attributed to the sheer level of organization that’s surrounded him, specifically the Tuesdays With Toomey crowd. Started by a nanny from West Philly, the group has gone from a few dozen protesters to hundreds every Tuesday at the same time. They blanket the sidewalks outside the senator’s offices in Philly, Pittsburgh, Scranton, Harrisburg and even Johnstown. A large part of that sustained effort has been asking the senator to hold an in-person town hall. He’s held 14 town halls since he took office in the Senate, and none of them were in Philadelphia. In fairness, Toomey held a “town hall” of sorts last month. It was the equivalent of a conference call, and some 15,000 people listened in, even though it was first advertised less than two hours before it began. He answered 11 questions. During that phone call, he addressed the utter flood of phones calls and faxes and letters his staff has fielded since November. Toomey said callers from out of state were tying up his phone lines for weeks as part of “organized, orchestrated efforts to block my phone systems.” As for as the hundreds showing up at his offices on a weekly basis? In recent days, Toomey has gone further than form letters or greetings from staff. He personally met with Tuesdays with Toomey protesters in Harrisburg and Pittsburgh. He said in a statement he discussed LGBTQ rights, health care and foreign security among other things with the Pittsburgh group. He also said he “looks forward to additional meetings of this nature across Pennsylvania soon.” Politically, whether he needs to meet with them is another story. Madonna said the thing about Toomey is that he recently won reelection, so unless something major changes, the senator can theoretically ride out the protests. He can hope they go away and push on until 2022. Unfortunately for him, the Tuesdays With Toomey crowd isn’t planning on pulling back, at least not until they can get Toomey to schedule an open and in-person town hall — in Philly. A previous version of this story incorrectly stated when Toomey’s most recent town hall was. It was in August 2015.